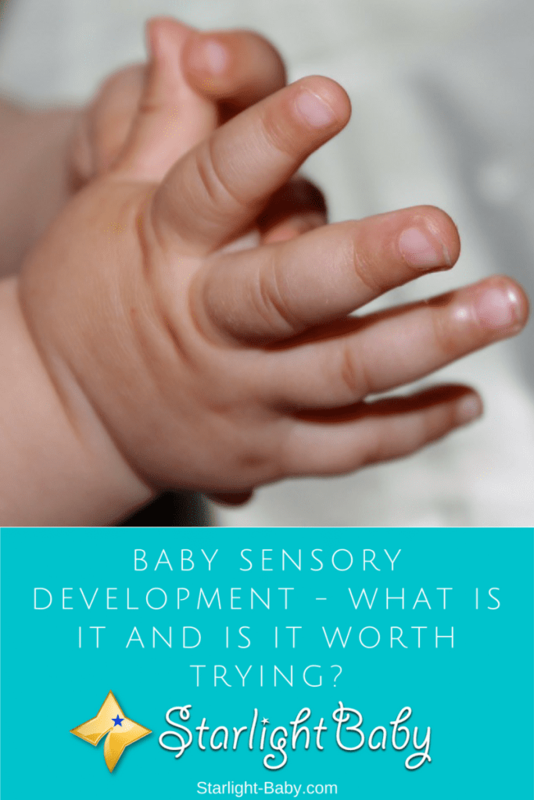 Baby Sensory Development Classes – What Are They And Are They Worth Trying? The number of baby groups available these days’ is awesome. You’ll find everything from baby ballet to swimming and even yoga! There’s always something new you and your little one can try out together and one class that’s quickly gaining in popularity is baby sensory development. This modern activity is said to encourage baby’s development by utilizing their natural senses. So, is baby sensory worth trying and can it really aid in your little one’s development? Baby sensory activities are designed to help babies learn more about the world around them. Aiming to enhance and utilize all of the five senses, the activities can also help to minimize the fear baby’s often feel when their senses grow suddenly over time. Initially, babies have very poor eyesight but they can recognize the sound of their mother’s voice and differentiate it from the other noises around them. They can also tell the difference between sour and sweet tastes and have shown to be more interested in pleasant scents. As they grow, these senses become stronger and many parents find baby’s which are usually pretty content can suddenly become frightened by different noises and touch. Through baby sensory activities, you expose your little one to all kinds of different sounds, smells and sights. This gradual exposure helps to minimize fear and can also aid in language development. At the moment, your baby doesn’t have the words to describe what they are experiencing. In baby sensory classes, the different senses are accompanied by words, to help baby understand what’s going on around them. This is just a small list of what’s included. They tend to combine many different activities into each lesson. Your little one will also get to touch lots of different textured objects. It’s worth comparing different baby sensory classes in your area to see which ones offer the most varied activities. There’s very little scientific evidence to suggest whether or not baby sensory classes provide the benefits they claim. However, ask most parents who have taken their little ones to these classes and you’ll see they can’t rate them high enough! When you learn that babies experience a significant brain structure advancement within the first 3 months of life, it’s easy to see why sensory activities may help. During this time, it is said that your baby will make an incredible two million new connections in their brain every second. That’s a lot to process! Sensory activities are designed to enhance and indulge these connections. Whether they make any difference to development or not, one thing’s for sure – they’re heaps of fun! Not only will your baby love it, but it’s great for you too. Staying at home with your little one is great, but it can start to make you feel really isolated. These types of classes give you something new and fun to do each week and they let you meet up with other parents, giving you the much-needed adult conversation most stay-at-home parents crave. The key thing with any baby class is that you do something both you and your little one is going to enjoy. Babies are fascinated by the different sounds, objects, and dancing in sensory classes. They love indulging their senses so taking part is definitely going to do you both good. Most parents who take their baby to sensory classes claim it’s excellent value for money. The best part is, you can take them to these classes as early as you want to. They are suitable for babies from birth, up to 13 months. Don’t want to take classes? That’s ok! You can do many sensory activities from the comfort of your own home. These are very basic ideas, but you’ll be surprised how much fun your little one finds them. With bowl exploration, simply fill it with dried beans, sand or rice and let baby sift them through their fingers. It goes without saying that when you are introducing your baby to small objects such as beans and rice, you’ll need to watch out that they don’t try to eat them! The touch game is another quick and simple idea. Lay baby on a soft blanket and start by waving a silky scarf overhead. Let them feel it, then switch to another, different textured object. Clothes pegs, tissue paper and silky objects tend to get the best reactions with this game. Water scooping is the easiest sensory game on the list and best of all – it’s free! Babies LOVE to play with water, especially if they have lots of different tools to use to scoop it up. You could enhance the experience by creating bubbles together too. Finally, music time is potentially the most fun! Why not try introducing your little one to different types of music. Some love to listen to classical tunes, while others love nothing more than a blast of heavy metal (at a reasonable volume of course!). Sing along to songs, dance with baby a little and have fun. This isn’t just an excellent sensory development game, it’s also a great stress-buster too. Overall, baby sensory is definitely worth trying out, even if you just do a few activities at home. If you can however, you may wish to join a local class as they create new, fun and interesting activities each week. Sensory Play – What Is It And Why Is It Important? I believe this is worth trying. However, there are no such training institutes that will teach me to baby sensory development in my town. However, I will surely follow the sensory activities that I can try at home. I have never explored these activities and I think my baby and I can have great fun through these activities. Development of one’s child sensory know how should be among the top priorities of any parent because it’s definitely going to help such child settle well in the family and as well as the society he or she finds himself/herself. All these tips suggested here in this article are worth trying out but my favorite is music and dancing. Anything that has to do with songs comes first for me in training sensory activities of a baby.